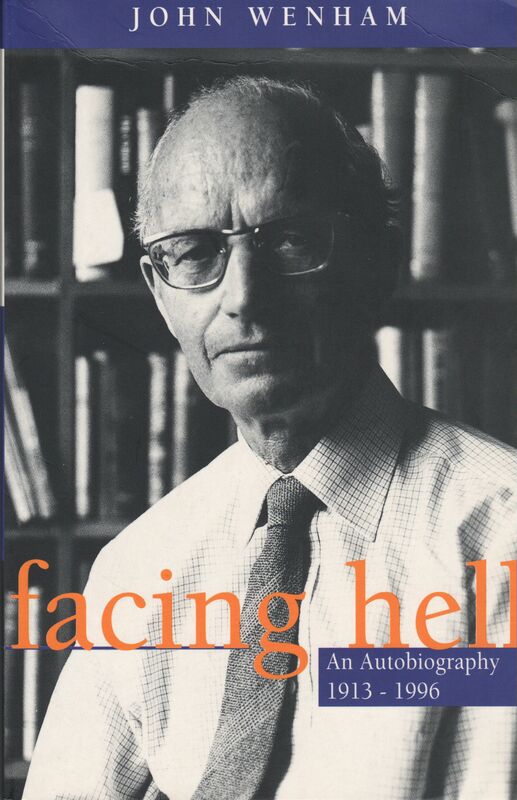 Recently, I had the opportunity to read the autobiography of the late British biblical scholar, John Wenham, entitled Facing Hell: The Story of a Nobody. I had tracked down this out-of-print book largely because I was under the impression that it focused on the development of Wenham’s doctrine of hell. For most of his adult life, he was an outspoken (though soft-spoken) proponent of a view called ‘conditional immortality’, sometimes referred to as annihilationism, to which I also subscribe. This view, in short, holds that those who are not saved by Christ’s work are not punished eternally in hell, but are eventually destroyed there as the consequence for their sin and rejection of God’s offer of eternal life. I believe that endless torment is a hideous and unscriptural doctrine which has been a terrible burden on the mind of the church for many centuries and a terrible blot on her presentation of the gospel. I should indeed be happy if, before I die, I could help in sweeping it away. Sadly, I would say that this intention failed to guide the book that resulted from it, though his short defense of conditional immortality in Facing Hell is quite cogent and well-stated, and will accordingly serve as an asset in the history of theological support for this position. However, what I did discover in this book is the story of a wonderfully earnest Christian thinker, who played an important role in the history of evangelical movement in the 20th century, and whose example deserves to be commemorated by subsequent generations of Christ followers. At one point in the book, Wenham says, ‘I have felt at times that I am a forgotten man’ and in the preface, he describes himself as ‘a person of most limited gifts, a mere nobody’, ‘an ordinary person’, and ‘third rate’. After reading this book, I would disagree with his humble self-assessment, though I do admire the spirit in which he offers it. In the following post, I would like to highlight some of the many extraordinary facets of the life of John Wenham that I discovered in his autobiography. Along with John Stott, J.I. Packer, and others, Wenham founded the Latimer House, an evangelical research center near Oxford University, designed to promote conservative Christian views in the midst of the liberal theological intelligentsia and to advance the evangelical voice in the Anglican church (thanks to Dom Vincent for the explanation of the purpose of the Latimer House, which I had a difficult time discovering!). While serving as Warden of the Latimer House from 1970-73, Wenham had the opportunity to influence many students at Oxford. At one point in his book, Wenham writes, “Tom Wright says that it was I who suggested that he should take up academic work-though I don’t in the least remember the occasion.” Many readers may recognize ‘Tom’ as N.T. Wright, one of the most influential evangelical voices in our time. Wenham was also good friends with F.F. Bruce and taught at various times with R.T. France, Colin Brown, and Anthony Thistleton. He is also the father of Old Testament scholar, Gordan Wenham, whom Tremper Longman has described as ‘one of the finest evangelical commentators today,’ as well as New Testament scholar David Wenham. Another significant figure in Wenham’s life, Eric Nash, who was called ‘Bash’, was characterised by Alister McGrath as having an evangelistic ministry to young men that ‘laid the nucleus for a new generation of Evangelical thinkers and leaders’. As we have seen in the influence of Wenham on N.T. Wright, I believe that John Wenham is one of these figures who may not be remembered by large numbers of people, but who has had a tremendous influence on Christian history in the 20th century. Some of Wenham’s writings are still held in high esteem within the evangelical community, including his Greek textbook, The Elements of New Testament Greek; his conservative defense of Scripture, Christ and the Bible (which was recently touted by Thomas Schreiner as being a “classic work on the authority of Scripture”); his harmonization of the gospel resurrection accounts, Easter Enigma; and Redating Matthew, Mark and Luke, which supports patristic views on the authorship of the gospels and a very conservative dating of their order of composition. This man was a classic conservative Bible scholar, well-regarded by some of the most traditionalist Christian thinkers, yet when he diverged from the party line on the subject of hell, somehow all of those conservative credentials and his profound understanding of Scripture vaporized into thin air and he became an antagonist against authentic evangelicalism, which is how he is portrayed in Al Mohler’s article in Hell Under Fire (where Mohler calls Wenham’s views on hell “hysterical”). There, Mohler quotes from an article by John Ankerberg and John Weldon that lists out a number of annihilationists, such as John Stott, Philip Hughes, and Wenham, and follows with the tag: “and other well-known and reputedly evangelical leaders.” These writers actually claim that “the doctrine of eternal punishment is the watershed between evangelical and non-evangelical thought.” I’m not sure who elected these individuals to be the border guards of evangelicalism, but maligning men like Stott and Wenham as being “reputedly” evangelical in light of all that they have done for conservative Christian thought is a tactic that is not worthy of any true believer (see how I can use the same insinuating maneuver that they have?!). 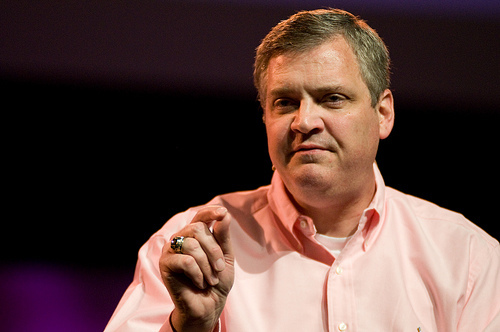 Given what I have learned about John Wenham, his status as an evangelical is undeniable, his contribution to contemporary Christianity is invaluable, and I hope that his memory and influence will be lauded long after the Mohlers and Ankerbergs of Christianity have been revealed as the Joe McCarthy’s of a sad era in evangelical history. I am proud to keep Wenham company in the ranks of a minority view on hell and I hope that I may in some small way help to contribute to his goal of sweeping away the traditionalist view of eternal conscious punishment in honor of the deeply thoughtful and fearlessly honest life that this man led for Christ and the truth. UPDATE: I just came across an excerpt from John Stott’s biography which reveals a bit about the influence of John Wenham on Stott! In my own mind and thinking, Wenham’s doctrine of hell was swept under the rug. I had not thought about the importance of this teaching until your articulate description of this interesting thinker and brother in Christ. I had not come across this man, but I certainly am now eager to consider his view (which I do not currently hold). It does seem to hold some amount of water at first glance. Hey Greg, can you point me in the right direction as to where to go to read an eloquent defense of annihilationism? I’ve found myself in the opposing camp thus far in life, but it tends to make my stomach hurt. P.S: I don’t like it when my stomach hurts. I will gladly email you some info. I think I will write up a post as well on the topic, since this may be helpful for me to clarify where I am coming from on this. Thanks for reading Dante–I appreciate your thoughtful comments! Thanks for sharing about Mr Wenham and his example to us as followers of Christ. That’d be brilliant! I’m looking forward to it. Thank you for this article. We have many articles that explore Afterlife | Conditional Immortality, Soul Sleep and Annihilationism which might be of interest. Thanks for your thoughts on this quietly influential Christian thinker. I do find the juxtaposition of being lauded by conservative theologians for his books/influence and being criticized for his doctrine of hell interesting. In any case, I’m encouraged to know that one can be influential, even if one’s name isn’t as easily recognizable as N.T. hi thank you so much for posting this. i’ve spent 30 years trying to save people from hell by telling them that God loves them, all the while with this angst in myheart that if He is so loving how could he return 100 years of sin for eternal torture. i’m currently pleading with my pastor to open his heart to the conditional immortality view as a nonessential. please forward to me whatever you have that would be current. i was researching on line and wenham’s name came up so i was looking for his book. didn’t find his book but found you. thanks again! I’ve emailed you some items…hope they are helpful! Ever since I was a little girl, I wondered why Christians believe in the eternality of hell when John 3:16 says those who believe “will not perish, BUT have everlasting life”. I’ve had it explained to me that perish refers to a spiritual separation, but aren’t we already separated from God spiritually when we sin? Many Christians are not even open to the possibility of annihilation and I’m not sure why. Almost every verse in scripture sounds like annihilation to me. It just doesn’t seem consistent with the God we know that he could let torment go on forever. A lot of people critisized Rob Bell’s book, “Love Wins” for opening up the discussion of eternal hell (and is it really biblical?). I give him props for at least opening up a discussion that really needs to happen, though I sense he leans more toward the possibility of eventual reconciliation with God after being punished in hell for sins. I think the eternal damnation thing really stops unbelievers from wanting to have anything to do with this religion. Greg, I would love anything more you have on this subject! And Dante, I feel you. The traditional view makes my stomach hurt, too. It is rather odd that people think that annihilationism is something bizarre, when the plain reading of many passages of Scripture would seem to easily support this view! I am definitely with you that Scripture as a whole seems to consistently lead back to this idea. It also puzzles me that people think annihilation is “the easy way out”–it still feels like an incredibly terrible punishment if you ask me! I was kind of bummed that Rob Bell didn’t really point to annihilationism in his book (other than a vague reference of like ONE SENTENCE!). Mark Galli, one of the lead editors at Christianity Today critiques Bell in his “Love Wins” and he leans toward an annihilationist perspective. There are a number of different theologians along with John Wenham who’ve embraced a view of destruction versus eternal conscious punishment, including John Stackhouse of Regent College (you can hear his lecture by download at http://www.regentaudio.com/RGDL4102K), I. Howard Marshall, Richard Bauckham, Michael Green (Lecturer at the Oxford Centre for Christian Apologetics), Clark Pinnock, etc. The best comprehensive study is Edward Fudge’s The Fire That Consumes 3rd Ed. It is the definitive work. Harder to find but worthwhile are David Powys’ “Hell”: A Hard Look at a Hard Question. I will also email you some documents on the topic. I’m so glad this piece was helpful in confirming some of your intuitions! Thanks for your honest question. Wenham himself admitted that Rev. 14 was problematic for his view–though he also pointed out that of the 246 verses in the New Testament which spoke about the fate of the unsaved, this was the ONLY one that seemed to indicate some kind of unending torment for human beings (found in his essay in the 1992 collection Universalism and the Doctrine of Hell). Revelation 20 speaks most clearly about the devil, the beast, and the false prophet being tormented forever, but Revelation 14 includes “those who worship the beast” will be tormented the same way. One thing that is curious about both of these texts (which indeed on a surface level seem to promote the view of eternal, conscious punishment) is that they are limited to such a small group of persons, three of whom are non-human (perhaps symbolic) and the rest are limited to those people who worship the beast during the tribulation of Revelation, which I read more symbolically as well, but even if it were literal, the text STILL does not say “all human beings who are not saved will be tormented day and night forever.” For such an important doctrine as the church has held eternal punishment to be, I would think it would be a bit more clear than a couple passages, mostly in a book of Scripture as enigmatic and symbolic as Revelation. Edward Fudge, the leading annihilationist thinker, proposes an interpretation of “day and night” the following way in his work The Fire That Consumes, page 243 of the 3rd edition: “John here writes that these wicked people have no rest ‘day or night’ in the genitive case, speaking of a kind of time. They are not guaranteed rest during the day; there is no certain hope that relief will come at night.” He argues that the traditionalist G.K. Beale agrees with this grammatical interpretation, and Fudge goes on to compare the form of day and night in Revelation to the usage in Isaiah 34:10, where Edom’s fire was said to be not quenched night and day and it’s smoke rising forever…however, we know in that passage that it was more metaphorical, since the smoke is not still rising forever. The same could be true of the Revelation passage. All that to say, I think coming to the text of Scripture is the best place to start. Fudge’s book provides a great view from the annihilationist perspective and I think that the collection Hell Under Fire probably contains the best traditionalist arguments for eternal conscious punishment (though I also personally found them to be specious and unconvincing). Dale, I am working on creating a website that will be a resource for exploring these questions…Could I email the link to you when I get it up and running? Thanks again for your thoughtful question & blessing on your study of the issue! One church that is quite well known for their unwillingness to condemn various views such as annihilationism is the Evangelical Covenant Church. They are a solid denomination (I wish I was in the ECC myself! ), have their priorities in the right place, and strongly emphasize freedom of doctrine in non-essentials (of which one’s view of hell is one). You can find a local church in the ECC at http://www.covchurch.org/find-a-church/. Other evangelical denominations that seem supportive of the position include the Advent Christian Church (see doctrinal statement here) and possibly the United Churches of Christ (I have a hard time figuring out which Church of Christ is the one which Edward Fudge is affiliated with, but I think this is the one–you can write to Mr. Fudge at edward@edwardfudge.com to ask him his advice…he’s quite a kind and generous guy and I’m sure he would have some thoughts to add). Thanks for sharing your thoughts. I personally think it’s actually a good idea to listen to all sides of an argument, so I enjoy hearing my traditionalists friends offer their thoughts about how to interpret texts. My main problem is actually those who stigmatize a view that they don’t truly understand. There is actually a quite exciting conversation happening at http://www.rethinkinghell.com. Adventist writer Leroy Froom published a two-volume set called CONDITIONALIST FAITH OF OUR FATHERS (in the 1950’s)in which he cataloged and excellently described all the proponants to his time of conditionalism of different denominations and their views and writings. The publishers, Review and Herald, don’t make the hardback set anymore, but I believe they can be ordered in paperback. A used hardback set is expensive at Amazon. I think this is different from the Conditionalist Faith of Our Fathers, no? not sure!? i couldn’t find an inexpensive copy of the one i was looking for and found this. thought it was the same. thanks for checking. That 4 volume set is even better with who’s who (of different denominations) concerning exegesis and interpretation of the prophetic portions of the Bible. The 2 volume set of Conditionalist Faith of Our Fathers you’re looking for will be a rare and valuable find indeed. It was after reading those books that I understood the issue and the challenge to get the word out. We human beings are so stuck on what we hear from trusted ones that we don’t bother to check the real spiritual source, -the Bible, and even less the Hebrew and Greek meanings to make sure of what we believe. I’m glad the Lord grants us dicernment when we ask, and resources to go to for those hard to get Biblical texts.